Travel editor William Sertl took a weeklong boot-camp course at The Culinary Institute of America in Hyde Park, New York. For this classic French dish, students were taught how to sauté the chicken on one side—without touching it—until it's golden, before turning it only once. 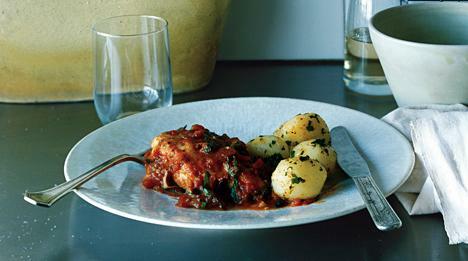 The pan-sauce lesson that followed yielded a simple, elegant cloak for the very juicy chicken. Core tomatoes and cut a shallow X in bottom of each, then blanch in a medium pot of boiling water 10 seconds. Transfer with a slotted spoon to an ice bath to stop cooking. Peel, seed, and finely chop. Pat chicken dry and sprinkle with 1/2 teaspoon each of salt and pepper, then dredge in flour, shaking off excess. Heat oil in a 12-inch heavy skillet over medium-high heat until it shimmers, then cook chicken, turning once, until golden and just cooked through, 6 to 8 minutes total. Transfer to a platter and keep warm, covered. Add garlic and anchovy paste to skillet and cook over medium heat, stirring, until fragrant, about 30 seconds. Add wine and bring to a boil, scraping up brown bits. Stir in tomatoes, stock, and olives and simmer, uncovered, stirring occasionally, until mixture has thickened into a sauce, 8 to 10 minutes. Whisk in butter and any juices from platter. Add chicken and simmer until just heated through, about 1 minute. Serve sprinkled with basil.